The first J/70 European Championship regattas sailed the Mediterranean from October 12-17, 2015. “It was a great championship! It was very intense both on the water and ashore with many complaints. This new class really appeals to sailors and I am delighted to be returning this winter for the Monaco Sportsboat Winter Series!” said Neven Baran, Jury president representing ISAF and head of umpire training. The Race Committee, chaired by John Coveney assisted by Pro Thierry Leret, launched six races during the competition in all sorts of weather conditions, with a steady wind filling in for the last races and light airs for the first, testing the seamanship of even the most experienced sailors. It was an exciting show on the water, where racing rules were employed to the uttermost degree and the presence of an international ISAF jury led by Baran was of the essence. Out of the 60 teams competing, from 11 countries, the first 25 boats had a chance to claim victory. It is not by chance that no team managed to pull off a string of race wins. The Mexican World Champion Fernandez Neckelmann Julian (Flojito y Cooperando) for example, won the fourth race that was their best performance, evidence of how fierce the contests were. Not once did the team leading the pack to the first mark ended up winning the race, with the downwind legs proving as tactically difficult as the upwind ones. All the finishes on a reach saw some dramatic luffs with spinnakers flying, delighting spectators and getting the adrenaline pumping. Everything was at stake for the top ten right up to the last race, as the slightest mistake on the start would make them risk the hope of being on the podium. As a good example, the Bretons Quentin Delepierre and Mathieu Salomon (Chariot Plus – Vannes Utilitaires), J/80 European champions who came third in the fifth race, will no doubt be regretting their performance in the sixth race and their premature start in the first. They finished 8th. The Italian Luca Domenici (Notaro Team), who is used to the Monaco race area, having participated in the last Monaco Sportsboat Winter Series and Primo Cup-Trophée Credit Suisse, is the first ever J/70 European Champion ahead of his compatriot Franco Solerio (L’Elagain), winner of the 2015 Italian Championship. The Spaniard Hugo Rocha (New Territories), winner at Kiel Week completes the podium ahead of his compatriot Gonzalo Araoeja (Sailway). Jacopo Carrain, Monaco Class President and leader of the 15-strong members of the YCM who make up the Monaco fleet, and who comprise the largest training and competition base of these one-designs in Europe. He came in tied on 5th. Leading the 18-strong German fleet was Moritz Bohnenberger (Touring Junior) who came 10th. At the awards’ ceremony, with the Credit Suisse Trophy and SLAM Advanced Technology clothing, first prize for the Corinthian teams went to the one Swedish boat, which has a Provençal name, Fanny, led by Oscar Lundovist. Thanks to the generosity of all the teams, the Championship raised 10,000 euros for the Lenval Foundation supporting sick children, with a check being presented to its president, Arnaud Pouillart. The proceeds will be used to buy pediatric equipment. An additional donation will finance the Christmas show, Conte sur Moi at Le Patio nursery that houses 36 toddlers. Next up at the Yacht Club de Monaco is the arrival of the 50 boats taking part in the Grimaldi Trophy, an IRC cruise race which starts in San Remo, Italy, October 17-18, 2015. 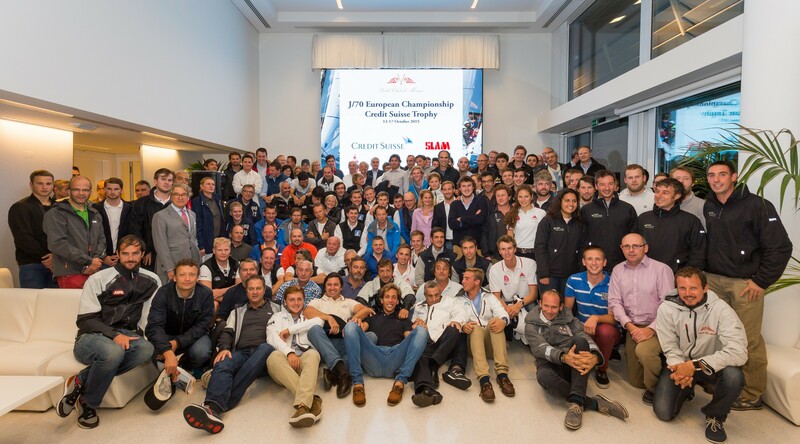 More than half these J/70 European teams are leaving their boats here for the winter to take part in the Monaco Sportsboat Winter Series, alongside the Melges 20, with their sights set on victory at the Primo Cup – Credit Suisse Trophy.